TA XBIEX, MALTA--(Marketwired - February 18, 2016) - This week DV entered the winners circle at All Slots Casino with a $516,467.88 win on the Major Millions 5-reel slots. DV's $3 bet netted her the jackpot prize while playing on her mobile. DV continued to play after her win and added several more wins to her account with successes on the Cashapillar and Adventure Palace slot machines. She plans to buy herself a new apartment with her winnings! Meantime, RM of Australia was enjoying the Cash Splash progressive jackpot on his mobile device when he triggered the jackpot win and won 42,000 Euro! RM is a new player at All Slots and had just completed his Welcome Week at the casino. He hit this progressive jackpot win after making only one deposit of $20. 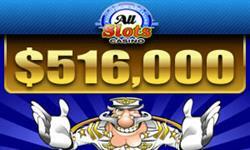 The Major Millions online slot machine is All Slots most popular progressive slots. The Major Millions jackpot starts at $250,000 and jackpot amounts climb from there. There are three versions of Major Millions slots. All three machines are linked, so a win on any of these machines triggers a jackpot that includes the deposits of players on all of the machines. This makes Major Millions the most lucrative progressive jackpot game at the casino. The Major Millions slot machine options include the 3-reel classic Major Millions slots, a 5-reel Major Millions video slots and a MegaSpin Major Millions game in which players can spin six Major Millions slot machines simultaneously. All Slots Casino has been providing online casino entertainment to players around the world since 2001. The casino offers hundreds of casino games including table games, slots, lotteries and card games. There is a three-tiered bonus program that includes a Welcome Bonus for new players, loyalty points for veteran players and monthly contests for everyone. All Slots games are powered by the Microgaming software developer. Players can access the games on their Internet browser at the Instant Casino or via downloaded software at the Download casino. Mobile users can play on their mobile browser -- phone or tablet -- on any of the top mobile platforms including on iOS, Blackberry, Android and other top-quality mobile devices. All Slots Casino is registered with the Malta Gaming Authority and regulated by the eCOGRA online casino regulation agency. The casino prides itself on fair play and fast payouts. For further information, visit: www.allslotscasino.com. All Slots Casino is dedicated to promoting responsible gaming. Gamers must be over the age of 18 to register and play at All Slots. There is an opt-out program to assist members who develop gambling problems.